Asbestos is a tricky substance, unfortunately the risk of exposure is all too common throughout New Zealand, especially if your home was built before the mid-1980s. It is a hazardous mineral fibre, but if treated correctly, you and your family could eliminate the risk of exposure. 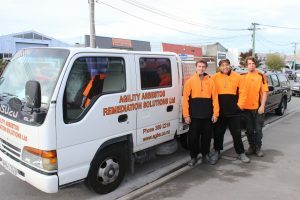 Agility Asbestos Remediation Solutions, Ltd. is a locally owned and operated Christchurch company that only employs fully licensed and certified workers to conduct all forms of asbestos removal. You can trust us to undertake all aspects of asbestos remediation within the Canterbury region. From full consultation and quotes to sampling and testing, to project management and removal, our honest and reliable tradesmen are here to help you avoid asbestos exposure. When it comes to asbestos testing and removal, you should only have experienced and qualified workers at your side. You can trust Agility Asbestos Remediation Solutions for all of your asbestos solutions. We employ full qualified and experienced staff, all of which are Ministry of Business, Innovation and Employment (MBIE) certified. Our company is very passionate about meeting our Health and Safety responsibilities for the benefit of our clients, our employees, the public and the environment. We understand that it is our duty to stringently comply with all regulatory requirements and guidelines for the safe removal of asbestos.